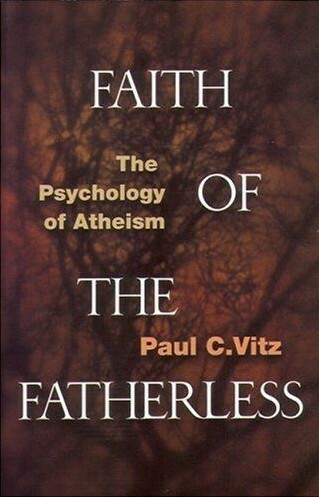 Paul C. Vitz, Faith of the Fatherless: the Psychology of Atheism. Dallas: Spence Publishing Co., 1999,174 pp. Paul Vitz is a professor of psychology at New York University and was himself an atheist until his late 30's. The simple but compelling thesis of his new book is that "the major barriers to belief in God are not rational but can be called, in a general sense, psychological" (5). This book argues that "the atheist's disappointment in and resentment of his own earthly father unconsciously justifies his rejection of God." Vitz turns Freud's projection theory of religion (belief in God is an illusion that derives from our childish need for protection and security) on its head, and argues that "the atheist's disappointment in and resentment of his own earthly father unconsciously justifies his rejection of God" (16). Stated in concrete social terms, Vitz's thesis is that absent or deficient fathers predispose their children to practical, if not philosophical atheism. A good part of the book consists of 20 biographical sketches of prominent post-Enlightenment atheists, focusing on their relationships to their fathers or father figures. This group includes Friedrich Nietzche, David Hume, Bertrand Russell, John-Paul Sartre, Albert Camus, and H.G. Wells. As a control group, the book provides biographical sketches of a similar number of prominent theists from the same period, including Blaise Pascal, Edmund Burke, Moses Mendelssohn, Soren Kierkegaard, G. K. Chesterton, and Dietrich Bonhoffer. Vitz finds that characteristically, the atheists had weak, bad or absent fathers, while the theists had good fathers or father substitutes. For the purposes of this brief review, Vitz' thesis has been greatly simplified. The book is a good deal more subtle and nuanced. The author concludes, "Sinceboth believers and nonbelievers in God have psychological reasons for their positions, one important conclusion is that in any debate as to the truth of the existence of God, psychology should be irrelevant. A genuine search for evidence supporting, or opposing, the existence of God should be based on the evidence and arguments found in philosophy, theology, science, history, and other relevant disciplines" (145).